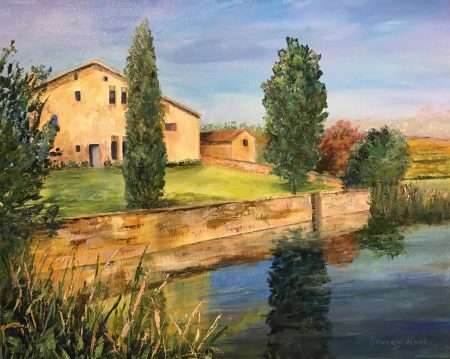 Hi, Beverly Hooks here and I hope you enjoy my new painting “Chateau de Pravins,” it was a fun historical location to paint. Please follow my website for more information regarding purchasing the original work or a beautiful Giclée Print. Established in 1251 the Chateau de Pravins sits on 6 hectors (2.5 acres) in the beautiful Region of Burgundy, France. In cooperation with the Beaujolais Villages, 57 acres produce Chardonnay grapes, along with a variety of red and white wines and beautiful champagnes in the fertile and organic vineyards. The Chateau de Pravins offers a restored 5 star hotels, a place to relax and enjoy the village wineries. Oh, how I wish I had taken the photos for this painting. Many thanks to my friend and student Leslie for sharing her trip and tour of France and for sharing her photos with our Painting Class. The Chateau de Pravins ranks high on my must see list.